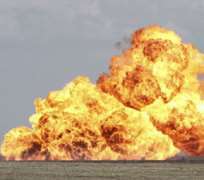 Residents of Ogba/Egbema/Ndoni Local Government Area of Rivers State were on Monday thrown into panic when a facility belonging to the Nigerian Agip Oil Company went up in flames after two explosions, thereby cutting of 20,000 barrels per day of crude oil production. Reuters quoted an official of the company as saying that the fire, which has not spread beyond the tanks' containment basin, started on Sunday evening and firefighters were trying to contain the blaze. The official said the cause of the fire was being investigated. Some residents of Ebeocha town, who were getting set for their various businesses, were jolted by the deafening sound of an explosion in the facility. The people became more apprehensive because a similar explosion had occurred at the same point around 10pm on Sunday. An eyewitness told our correspondent that no casualty was recorded as fire fighters from Agip and Total Exploration and Production raced to the place to put out the inferno. The eyewitness, who identified himself simply as Ella, said, 'Nobody was injured and nobody died. When it happened, fire service men came almost immediately to fight the fire. We cannot really say what caused the explosion. Speaking on the incident, the Chairman of Ogba/Egbema/Ndoni Local Government Area, Mr. Augustine Ahiamadu, dismissed speculations that the incident could be as a result of sabotage. Ahiamadu, who said the cause of the fire could be mechanical, described the site where the incident happened as a high risk zone, adding that the tanks were old and needed to be replaced. The council chairman, however, said though two explosions occurred Sunday night, he could not confirm if there was any casualty.